"'Alice and the Fairies', July 1917." "A photograph of Frances 'Alice' Griffiths (1907-1986) taken by her cousin Elsie 'Iris' Wright (1901-1988), using her father Arthur's Midg quarter-plate camera, the first in the 'Cottingley Fairies' series. Frances, posed in the family garden, stares into the camera past dancing fairies, one of whom plays a pipe. A small waterfall tumbles into a 'beck', (dialect for 'stream'), beyond. The fairies were actually drawings by Elsie, secured in the ground with hat pins. It was a secret the girls decided to keep until the 1980s - once they realised the extent of the deception - to protect the public reputations of those who believed in the 'truth' of the images. Alice was probably the name given to Frances by Sir Arthur Conan Doyle (1859-1930) in an attempt to conceal the girls' identities when he published the photographs." 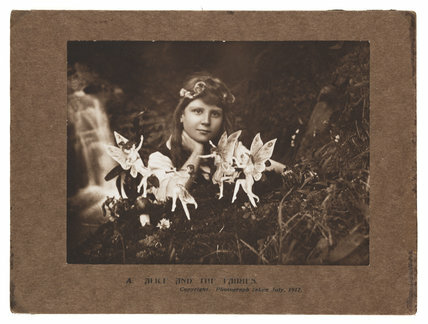 "Drawing of a fairy, c 1983"
"'Fairy Sunbath Elves Etc', August 1920." "'Fairy Offering Flowers To Iris', August 1920." "'Iris and the Gnome', September 1917."